Since the end of the Soviet Union, Canada has played a leading role in the international response to Ukraine and to the challenges associated with its transition to independence. As Conservative and Liberal governments alike have sought to adapt foreign policy to contend with uncertainty and upheaval, the relationship between Canada and Ukraine has remained resilient. In Strategic Friends Bohdan Kordan examines the intersections between global developments and Canada's evolving foreign policy in light of national interests, domestic factors, and political agency. His historical-comparative narrative follows the post-Cold War aspirations and ambitions of the Mulroney, Chrétien, Martin, and Harper governments as they worked to minimize conflict, increase security, contextualize the independence movement, manage bilateral relations, and promote election monitoring, as well as defend liberal democracy and the territorial integrity of Ukraine. Consulting media reports, official speeches, statements, published government documents, and archives of the Ukrainian Canadian Congress, Kordan highlights both continuities and shifts in policy during the leadership of four prime ministers, and reveals the undercurrents of contemporary Canadian foreign affairs. 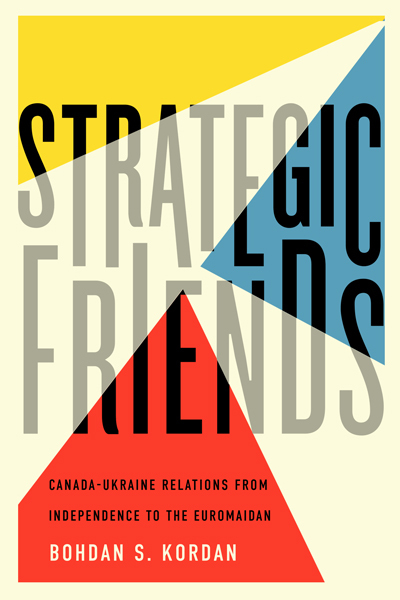 Investigating the progression of the Canada-Ukraine relationship, Strategic Friends queries the dynamics that have shaped Canada's foreign policy response in an age of change.